You don’t need a facelift or a time machine to feel younger. 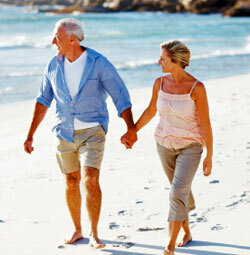 Some simple lifestyle changes can help you turn back the clock, according to the website Health.com. Start by getting enough sleep. Your body and mind need sleep to reenergize. Staying up too late can keep you from getting the eight hours of sleep you need each night. It takes about six weeks to reprogram your body to expect an earlier bedtime, so don’t toss in the towel too early. If you start getting enough sleep, you will have more energy, feel more alert and look better. You also can feel younger if you eat healthy food. Focus on fruits and vegetables that are rich in vitamins, minerals and age-battling antioxidants. Choose lean meat and low-fat dairy. Save desserts and other treats for special occasions—you’ll enjoy them even more that way. And be sure to drink plenty of water. Lifting weights can make you feel more like you did years ago. Weightlifting not only builds muscle, but it also can help boost your metabolism—and that makes it easier to shed those extra pounds. Plus, by building up your muscles you help protect yourself against injury. And feeling and looking stronger can give you more confidence. If you need help getting started, go to a gym or hire a personal trainer. Having a little money on the line also might motivate you to keep at your new fitness routine. Don’t be afraid to splurge a little on your appearance. You don’t have to go under the knife, but make the occasional trip to the spa or the salon for a new cut or color. And in the meantime, buy some high-quality shampoo or lotion. If you are a woman, experiment with new makeup; maybe even get a makeup consultation. If you look old and tired, you are more likely to feel old and tired. Changing your routine can help keep your brain engaged and active. Don’t get stuck doing the same things at the same time. At the very least, change up your schedule. Even better, try something new. Take a class, learn a new language, take up knitting, volunteer--whatever it takes to keep you on your toes and help you avoid that “been there, done that” feeling. Travel back in time. Listen to the music you loved in college. Watch an old movie, or revisit some favorite haunts. It sounds counterintuitive, but researchers from Harvard found that people were happier and healthier when they were in an environment that reminded them of their youth. You don’t have to break out the bellbottoms, but it can’t hurt to put a little Motown on your iPod. Most important, stay optimistic. Sure, life has dealt you some setbacks, but you’re still here. Focus on the things that are great in your life, and don’t worry about the things that aren’t—unless you can do something to change them.